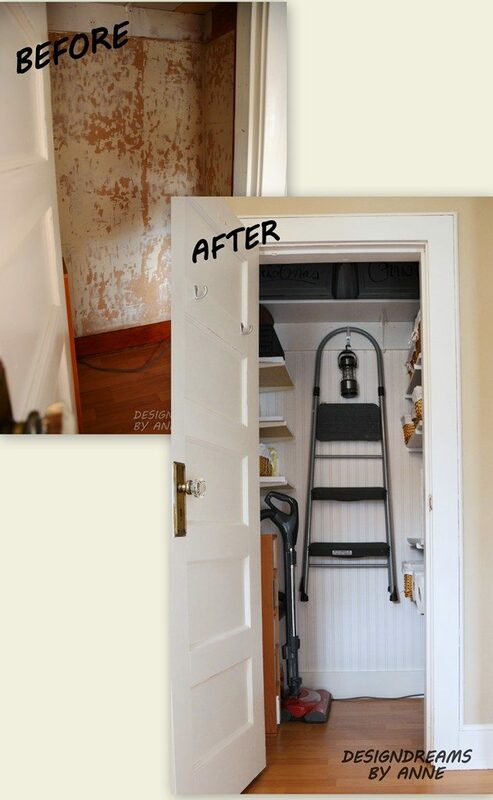 Take everything out of the closet and clean the walls and ceiling. This particular closet had been wallpapered with 3 different wallpaper patterns and the glue would not come off the walls so I chose to re-wallpaper the space with textured bead-board wallpaper. It was a quick and easy way to redo the walls, but paint is another option. I also painted all the trim in the color of the wallpaper for a seamless look. Two sets of adjustable slotted shelving systems are installed on either side of the closet space and 12” deep heavy duty metal brackets hold a single shelf that runs the length of the back of the closet. Pre-fab coated shelving from the local building supply store is cut to the exact depth of my closet. A sheet of ½” plywood cut down to size is a less expensive alternative. Inexpensive gift baskets that I picked up at super low clearance prices after Christmas help to corral supplies and make the shelves look less cluttered. The adjustable slotted shelving system allows for the height of the shelving to be altered quickly and easily should needs change. These systems are fabulous for installing at the edge of clothes closets as well, and provide loads of space for items that need to be folded or for shoe storage. The shelves can be run from floor to ceiling and repositioned easily if storage needs change. To save on costs, check out yard sales and online classifieds for deals on shelving, bins, baskets, hooks and even wallpaper and paint. If there isn’t closet space to spare, hang narrow shelves at the end of a hallway. The bins and baskets keep everything looking neat and tidy so you won’t have to worry about it looking messy.